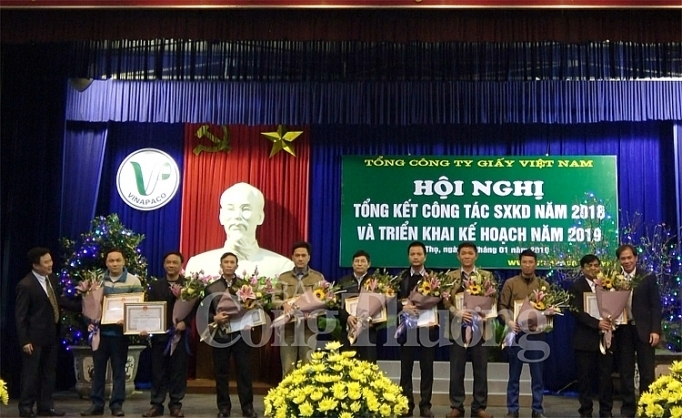 The Vietnam Paper Corporation (Vinapaco) earned nearly 2.6 trillion VND (111.8 million USD) in revenue in 2018, exceeding the yearly target by 19 percent and recording an annual increase of 15 percent. The figures were released at a conference to review the company’s performance last year and set out tasks for 2019, which took place in the northern province of Phu Tho on January 22. Accordingly, in 2018, Vinapaco’s paper output surpassed 120,000 tonnes, of which over 113,000 tonnes were consumed. It exploited 160,000 cubic metres of timber and planted new forests spanning more than 2,300 hectares. The company’s contribution to the State budget and profit reached 131 billion VND (5.63 million USD) and 70 billion VND (3.01 million USD), respectively. Speaking at the conference, Chairman of the Vinapaco Members’ Council Hoang Quoc Lam said that in 2019, Vinapaco will focus on restructuring its apparatus, finances, development investment, and production; while carrying out a price assessment to sell its Phuong Nam wood pulp mill in the Mekong Delta province of Long An. The corporation also plans to restructure its southern paper material single-member limited liability company and build a 135-billion-VND (5.8 million USD) wood pellet manufacturing plant in the Central Highlands province of Kon Tum, he unveiled. This year, it expects to reel in over 2.6 trillion VND, contribute 121 billion VND (5.2 million USD) to the State budget, exploit more than 130,000 cubic metres of timber, and plant close to 2,000 hectares of forests.